A little over a month ago, With/Without: Spatial products, Practices and Politics in the Middle East, a collection of essays about contemporary Arab urban issues, was released at the Dubai International Design Forum. Published by Middle Eastern cultural magazine Bidoun and the Forum's organizer, Moutamarat, it has contributions from writers across the Arab world, including two writers who contribute to Arabist.net: Issandr El Amrani on Cairo's al-Azhar Park and Ursula Lindsey on The Yacoubian Building. And tons of other fine people too, such as the great Moroccan photographer Yto Barrada, Director of the Iraqi National Archive Saad Bashir Eskander, renowned Dutch po-mo architect Rem Koolhaas and Lebanese historian Fawwaz Trabulsi to list only a few of the contributors who wrote the 14 essays on themes such as suburbia, shopping malls, public parks, street life, universities, or skycrapers. I've just received my copy (which had been intercepted by the Egyptian Postal Service and inspected at length for subversive material, apparently) and it's a handsomely designed volume, printed on archival paper with lovely photography. Where can I acquire this gem of a book, I hear you say? Well, although distribution deals are still underway, you can start by visiting the Bidoun site for ordering info or read the press release after the jump. As Dubai builds unprecedented realms of new newness, other parts of the Middle East grapple with physical and symbolic histories. Relics come up against re-invention and revolution. Micro-mutations in Middle Eastern politics or economics are part of our shared ‘local’ news around the globe. With/Without is an anthology that casts an eye across the broader swathes of the Middle East today. Featuring an archival design, this hardback book is essential reading for anyone interested in the social makeup, design and architecture of Middle Eastern cities. 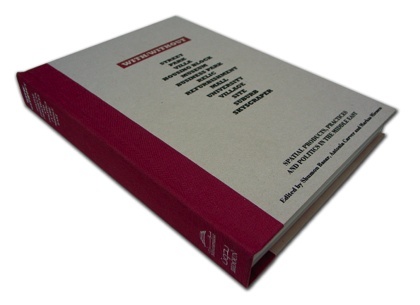 Each of the fourteen chapters takes an obvious architectural or institutional typology (the museum, the villa, the street, the skyscraper, etcetera) and illustrates it with essays, interviews, and documentary photographs. Subjects range from the redevelopment of Martyr’s Square in Beirut; gated communities in Istanbul; Dubai’s mall culture; bridge building in Mecca; and the creation of a new Iraqi flag in the post-Saddam era. The underlying question in all of these inquiries is: how do spaces and territories form fundamental ideas about individuals, communities, and worlds? Co-published by Bidoun and Moutamarat, With/Without is edited by London-based architects/critics Shumon Basar and Markus Miessen, with Bidoun editor Antonia Carver, and designed by the award-winning Dubai agency 9714.